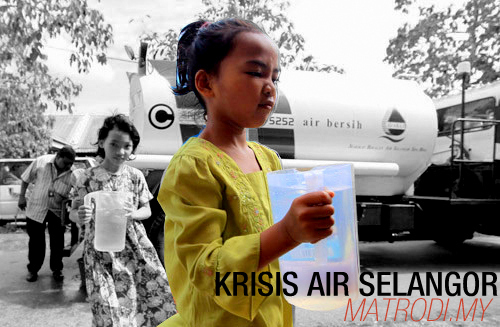 I wrote this article three months ago when water rationing in Selangor has ended. Today when I returned from UK, I was exasperated to know that water disruption will take place in Selangor- my hometown. Therefore, I decided to publish this article. We don’t need any water expert or visionary leader to tell us that Selangor is going to consume more water in the future. Just look at those skyscrapers in Kuala Lumpur, the opening of several new townships and the massive increase of population in Klang Valley, it’s obvious that this is a state where the pace of development has been unstoppable. The demand for treated water would grow between 3%-4% annualy. In 2014, the daily demand for water in Selangor will reach 4,907 million litres, whereas the effective supply capacity is only 4,431 million litres. It means Selangor would face water shortage by almost 500 million litres per day and some politicians want us to believe the water rationing was due to dry spell season. So how do we cater the future demand? The answer is by channeling the raw water from Sungai Pahang. To do that, a dam, intake and pumping station together with 44.6km tunnel have to be built. But this water has to be treated. Therefore Langat 2 treatment plant is needed. The whole project costing RM8.65 billion will lift Selangor’s total capacity to an estimated 7,338 mill litre per day- 70% more than the current capacity. Selangor will have enough water until 2025. However, the state government led by the ‘stingy’ Tan Sri Khalid Ibrahim has previously refused to give his approval for the 15 lots of land needed for the construction of Langat 2. The reason? ‘There’s water everywhere and we even have flash floods. Selangor has enough water until 2019.’ So said the Menteri Besar. Therefore the state government believes that other alternatives like cutting losses from non-revenue water, and exploring other water sources like rainwater, lakes, and underground water should be prioritised instead of the Pahang-Selangor water transfer. Never mind if the project is already 80% completed. Why the state government should cares that without Langat 2 plant, the dam and a 44.8km-long pipeline would be rendered dysfunctional and possibly become the biggest white elephant project in the country. First option, they want to use membrane technology from Canada. But this technology will only improve water quality, not increase water supply. Not only there is no necessity to improve our raw water that is already good, the technology is costly to implement. The cost of implementing the technology is about RM95mil per treatment plant, and if it is used on all 34 plants it would be around RM3bil-RM650 million short of the Langat 2 plants. Therefore, option 1- not feasible at all. Second option, Selangor state government is planning to invest RM300 million to generate additional water of 600 million litres per day from the rivers in the state. The plan involves the collection of storm water from the Selangor River at old mines in Bestari Jaya. However, this collection is estimated to be sufficient only for four months during the dry season when there is no supply from the Selangor River. That means, RM300 million plan is a short term solution unlike Langat 2. Option 2- feasible only for a short term period. Third option, TS Khalid announced that water from ponds around Sungai Selangor is pumped into the river to boost its flow. The RM10 million fund has been approved to buy high-powered pumps. But how safe is the water from disused mines considering that the water has been stagnant for years? Water from the surface may not pose problems, but if taken from the bottom of mining pools, heavy metals would be pumped as well. Does the citizen in the most developed state deserve to get water supply from disused mines? If that’s the case, why don’t they just consume water brought in by floods. It’s free though. Option 3-not only feasible, but dangerous. Clearly, after few years of dilly-dally with the alternatives for water solution in Selangor, Langat 2 remains the most sensible solution. The truth is, the state government wants to leverage on Langat 2 plant’s approvals to take over Selangor’s water assets. Why do they want to take over all the water companies? It is because they have promised to provide free water and no increase in water tariff to Selangorian. Under the concession agreement, water tariff will be gradually increased. Failure to honour the agreement means the state government has to compensate Syabas. Of course, these are the populist move. Who doesn’t like free water anyway? But good governance is not about being popular. It’s about being responsible. That they deprived 8 million residents in Selangor from continuous water supply was a clear example how irresponsible the state government. Because of the populist election manifesto, the Selangor Government halted any increase in water tariff, even though it was provided for under the concession agreements. Nor does it compensate the company. So without extra revenue, Syabas has no funds to carry out the Capex programmes such as replacement of pipes and other water infrastructure in the concession area. Admittedly Selangor has the highest NRW in Malaysia. It is due to the pipes that mostly laid over 50 years ago. Therefore a huge sum of money is needed to replace about 6000 km of pipes. Assuming RM500 per meter cost of standard sized (300mm) steel pipes, the estimated replacement value is RM3 billion. Obviously the state government couldn’t afford to finance the cost. This explains why water industry in Selangor has been privatised. It’s simply because we need money from private sector. And the result is encouraging. In the first year of privatisation, Syabas has managed to reduce NRW by 10% from 43% to 33%. Only when the state government through Suruhanjaya Perkhidmatan Air Negara (SPAN) decided to freeze all NRW related works in 2008, the NRW percentage remains. The state government knows about this. They are not stupid. But being trapped in free water promise, they couldn’t allow any tariff increases. So they decided to acquire all water companies in Selangor. After all, Syabas was found to breach several contract terms in a 2008 audit report. They supposed to conduct open tender but they have awarded RM600 million worth of contracts in direct negotiation instead. And one of the foreign company secured RM375 million pipe replacement project instead of sourcing for local pipes company as required. Whatever, after more than five years of trying, they failed to acquire the companies on a “willing seller, willing buyer” basis. But the underlying issue is solving water supply and acquiring water assets are two different matters and should be treated separately. Do you put on hold the MRT project just because you wanted to nationalise our toll concessionaries? So they play politics with water. More than 700 new development projects could not proceed due to dwindling supply reserve. 130 factories worth RM4 billion in investments and 12,300 jobs could not get approval to be set up in Selangor. RM750 million that has been used to finance 11 mitigation projects could have been saved. Call it political expediency or political stupidity. The truth is the ‘stingy’ Menteri Besar should understand construction of the plant would have been much cheaper to build had it started three years ago. Langat 2 would have been operational now, providing extra 1,130mil litres daily and avoiding the crisis today. And of course this article wouldn’t be needed. As always, impressive and straight to the point by ramrod Mat Rodi. Hopefully it will open the eyes of Selangor folks and those who walks in the corridors of power in Shah Alam. The people have been taken for a ride for almost two terms and they don’t even know it. What were they thinking? These people thought they’re different and sophisticated than anybody else. With ‘ubah’ slogan state government changed. Apparently not for the better. Though blessed being living in the most advance state with modern infrastructure to boots, its people have to drink waters from mining pools. How come? When you finish your studies, please come back and serve the country. Malaysia needs energetic and brilliant mind like you. Come home and straight out some craps here. I have have enough. Welcome back Mat Rodi and thanks for the great commentary. Check out some of my blogs on the water crisis. The fact that DAP’s Tony Pua and Ronnie Liu are hammering Tan Sri Khalid over has handling of the water crisis is telling. They must be under a lot of pressure from their constituents, including many business people who are adversely affected by the water crisis. Heck! I’m sure you don’t have such water shortages in the Middle East but one serious El Nino in tropical Malaysia and we have a water crisis in Selangor State. Do we have to fly to Iraq to have a shower? could you please give me a reliable source for these good information. I am a PhD student at UKM and and I am in urgent need for such these information. Salam sir, i’m using ur article as my assignment resource in my critical thingking subject. Can i have ur full name atleast so that i could site it in appropriate. Your reply and concerns are so appreciate. Thank you.